14" Concrete Saw Details - Quasius Equipment, Inc. 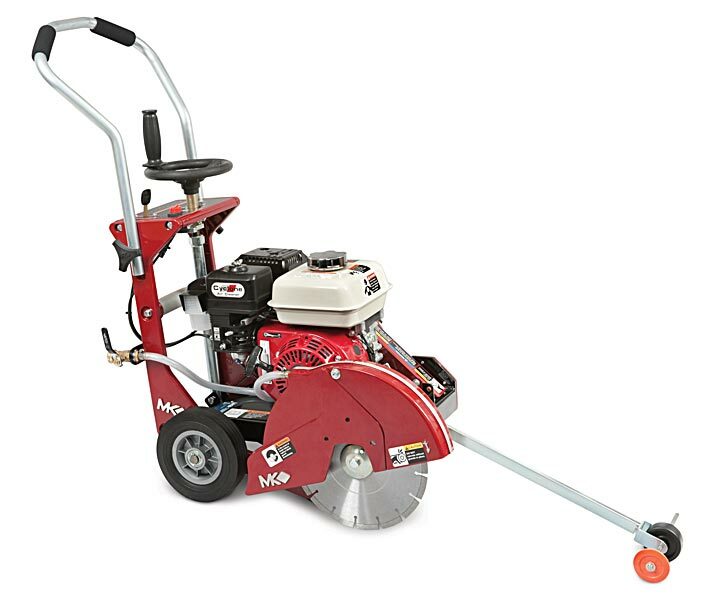 The MK CX-3 Series Saw is a walk-behind concrete saw with a 14" diameter blade capacity. It's powered by a Kohler Command Series engine. This is a powerful engine which offers plenty of power yet islight enough to handle easily. It can be used wet or dry depending upon the blades used. Abrasive blades are available and are popular for small jobs due to their relatively low cost. The blades gradually wear down and their diameter is reduced as they cut. New blades are $10.00 but they are measured when they go out and when they come back so you only have to pay for the amount that you use. Abrasive blades are designed to be run dry but water can be used to help control dust if desired. Diamond blades are also available. Their narrower cross section allows for faster cutting and the diameter doesn't reduce as you cut, so your depth of cut will be more consistent. Because diamond blades are quite a bit more expensive, these are generally rented at a cost of $35.00 per day. The diamond blades used with this saw can be run wet or dry. This is an excellent saw for straight cuts that don't weave for crack control or for take-out work. The walk-behind concrete saws fit well in the back of vans, pickup trucks, SUVs, or small trailers but don't go into car trunks.